Wendy Carlin is Professor of Economics at University College London (UCL), Research Fellow of the Centre for Economic Policy Research (CEPR), London, and Fellow of the European Economic Association. Her research focuses on macroeconomics, institutions and economic performance, and the economics of transition. She is a member of the Expert Advisory Panel of the UK’s Office for Budget Responsibility. She has acted as a consultant for international organizations such as the European Bank for Reconstruction and Development (EBRD), London, and the World Bank. Macroeconomics: Institutions, Instability and the Financial System (2015). The third book integrates the financial system into the macroeconomic model to allow for analysis of financial cycles as well as business cycles and growth. Professor Carlin is leading an international project – the CORE project – currently funded by a number of organisations which can be found here. The CORE project has published The Economy, which is free on-line at www.core-econ.org. 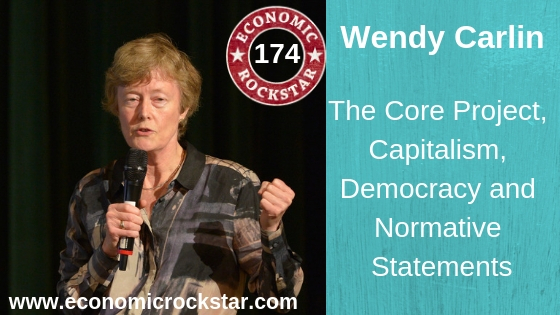 In 2016 Wendy was awarded the CBE for services to economics and public finance. This is an excerpt from a previous conversation that I had with Professor Stephen Wright but was unreleased at the time. We felt it appropriate that it should be released at a time if I ever spoke to Professor Wendy Carlin. This day is coming and now this part of my conversation with Stephen can be released. If you’re an Android or Windows user, you can download their free app to get offline and mobile access. CORE ebooks are available in the Apple iBooks store for free. This is a reflection on some episodes from 2018. The themes I have chosen looks at growing up in the Great Depression and what to expect in the future with AR and AI, as well as Institutions, Individualism, Cooperation and Reciprocity. 123 Vernon Smith on his early childhood years during the Great Depression and how they survived by moving to live on a farm before losing it all, his mother as a socialist and who she voted for in the Presidential elections in 1919 when women were first given the right to vote in the US. 162 Jennifer Burns on Ayn Rand’s views on Capitalism, Communism and Christianity and why the individual is better that the collective, the virtues of selfishness, hippies in the 1960s, Objectivism, Existentialism and Nietzche. 147 Ngaio Hotte on Elinor Ostrom’s work on collective action and cooperation to reach mutually beneficial outcomes and how this can relate to natural resource problems as well as Ostrom’s observation of reciprocity in Game Theory. 135 David Zetland on group cooperation to protecting public goods such as the water supply and the environment and how cooperation rewards and benefits groups. 168 Harry Markowitz on growing up with the family grocery store during the Great Depression in an upper middle-class area, using the museums and libraries of Chicago as a teen, Darwin’s ‘Origin of Species’ as an influence and how reading the great philosophers and his self-study of the physical sciences helped with his placement at the University of Chicago. 125 Eugene Fama on his early academic year to the development of the Efficient Market Hypothesis as well as the Benoit Madlebrot’s discovery of Louis Bachelier’s paper. 167 James Kenneth Galbraith on the influences of his father John Kenneth Galbraith on his own academic work in economics and the significance or lack of significance of economics in academia today. 136 Abby Hall on the growth of big government since 9/11 and the militarisation of the domestic police force in the US from the creation of the first US SWAT team during the US occupation of the Philippines in 1898. 149 Soumaya Keynes on why trade should not be blamed for the loss of jobs, the Economic Consequences of Our Grandchildren by Soumaya’s great grand uncle John Maynard Keynes, trade blocs in the 1930s compared to todays global trading systems to remove barriers and maintain peace. 156 Peter Boettke on how F. A. Hayek developed his interest in economics through the Viennese culture and the intellectual hubs which were based on law, philosophy and politics and the mentors he encountered as well as Hayek’s observations of the nature of macro volatility, the growth of government, technology and inhumanity during his life. 163 Kevin Kelly on technology of the future such as AI and AR to help to quantify and track our movements and expressions to help with our decision-making. In 1973, Jim co-founded of the Quantum Fund with George Soros and having retired at the age of 37, Jim spent some of his time traveling on a motorcycle around the world – a Guinness World Record and one which is documented in Investment Biker, a international bestselling book. He has been a guest professor of finance at the Columbia Business School. In 1998 he created the Rogers International Commodities Index (RICI) and has been an outspoken advocate of agriculture investments. Between 1999 and 2002, Jim and his wife did another Guinness World Record journey travelling 116 countries in a custom-made Mercedes. He wrote Adventure Capitalist following this around-the-world adventure. In 2007, Jim moved to Singapore due to the investment growth potential in Asia. Jim shares some excellent advice about how you should approach investing and what the next 10 to 20 years could turn out for the global economy. Investment Biker: Around the World with Jim Rogers (1994). Adventure Capitalist: The Ultimate Road Trip (2003). Hot Commodities: How Anyone Can Invest Profitably in the World’s Best Market (2004). A Bull in China: Investing Profitably in the World’s Greatest Market (2007). A Gift to My Children: A Father’s Lessons For Life And Investing (2009). Street Smarts: Adventures on the Road and in the Markets (2013). Jennifer Murtazashvili is professor and director of the International Development Program at the Graduate School of Public and International Affairs at the University of Pittsburgh. Her research explores questions of governance, public administration, and local institutions with a geographical focus on Central and South Asia and the former Soviet Union. Jennifer’s first book, Informal Order and the State in Afghanistan, was published by Cambridge University Press in 2016. A second book, Land, the State, and War: Property Rights and Political Order in Afghanistan (with husband Ilia Murtazashvili) is under revision. Professor Murtazashvili’s current projects include research related to the (unexpected) role of bureaucracy in conflict-affected states, local governance and social institutions in Central Asia, and the geopolitics of Central Eurasia. Jennifer also serves as an elected member of the Central Eurasian Studies Society executive board. Her research reflects extensive field experience where she has lived on the ground for five years in former Soviet Central Asia and about three years in Afghanistan. She has collected diverse types of original data employing a wide range of tools to answer important policy questions ranging from ethnographic fieldwork, interviews, focus group discussions, public opinion surveys, as well as field experiments. In addition to academic endeavors, Professor Murtazashvili remains deeply engaged in public policy. For three years, she served as a democracy and governance officer for the U.S. Agency for International Development in Tashkent, Uzbekistan, a Peace Corps Volunteer for two years in Samarkand, Uzbekistan, and for more than a year as a Senior Research Officer at the Afghanistan Research and Evaluation Unit. Jennifer has also served as an advisor for a number of organizations including the World Bank, U.S. Agency for International Development, U.S. Department of Defense, the United Nations Development Program, and UNICEF. Dr. Harry Markowitz is the principal of Markowitz Company, and an adjunct professor at the Rady School of Management, UCSD. Dr. Harry Markowitz has applied computer and mathematical techniques to various practical decision making areas. In recognition of his work, Harry received the 1989 Von Neumann Award from the Operations Research Society of America for his work on portfolio theory, sparse matrix techniques and the SIMSCRIPT simulation programming language. In 1990 he shared The Nobel Prize in Economics for his work on portfolio theory. The Utility Analysis of Choices Involving Risk by Friedman, M. and Savage, L. J.
Single-Period Mean-Variance Analysis in a Changing World by Markowitz, H. and van Dijk, E. L.
James Kenneth Galbraith is the Lloyd M. Bentsen Jr. Chair in Government/Business Relations and Professor of Government at Lyndon B. Johnson School of Business Affairs at The University of Texas at Austin. James was executive director of the Joint Economic Committee of the U.S. Congress in the early 1980s. He chaired the board of Economists for Peace and Security (1996–2016) and directs the University of Texas Inequality Project. He is a managing editor of Structural Change and Economic Dynamics. From 1993 to 1997, he served as chief technical adviser to China’s State Planning Commission for macroeconomic reform, and in 2016 he advised the presidential campaign of Senator Bernie Sanders. In 2014 he was co-winner, with Angus Deaton, of the Leontief Prize for Advancing the Frontiers of Economics. James has a PhD from Yale University. James is the son of the late John Kenneth Galbraith, renowned economist, public official and diplomat. In this episode we discuss James’ views on the teachings of mainstream economics today, his work on inequality, democracy, the financial crisis of 2008 and the impact it has had on Greece as well as, of course, his father John. In this episode, James K. Galbraith mentions: John Kenneth Galbraith, John Maynard Keynes, Karl Marx, Joseph Schumpeter, Yanis Varoufakis, Wassily Leontief, James Tobin and Branko Milanovic. In this episode, James K. Galbraith mentions: Charles Saunders Peirce and William James. James K. Galbraith’s thoughts on the economics discipline and how mainstream economics is failing in academia. How academics may have lost the ‘sense of adventure’ by the time they get a tenured position. Does economic growth result in increasing inequality or are there other causes? About the University of Texas Inequality Project (UTIP). Does growing inequality lead to economic instability? Rental crisis in Ireland as a result of the property crash of 2008. How Iceland faired after the Great Recession in comparison to Ireland. The Greek economy and the Poison Chalice. The ‘Extend and Pretend’ approach (lend now and pretend to pay later) to fixing the Greek economy after the financial crisis which will lead to economic stagnation and removing the social fabric of the country. Were the loans to Greece a mistake and what happened to the money that was lent to Greece? Were the privatisation of Greek ports and airports the best way for Greece to overcome it’s economic collapse or was it a way of satisfying its creditors? If the League of Nations was never established, could there have been military consequences for those countries that endured economic collapse? About the ‘Democracy in Europe Movement’ and the ‘New Deal’ to maintain democracy, tackle the problems of climate change, the problem to renovate investment and stabilise the human situation across the crisis-ridden countries across Europe. Why the Chinese were interested in Wassily Leontief and John Kenneth Galbraith. 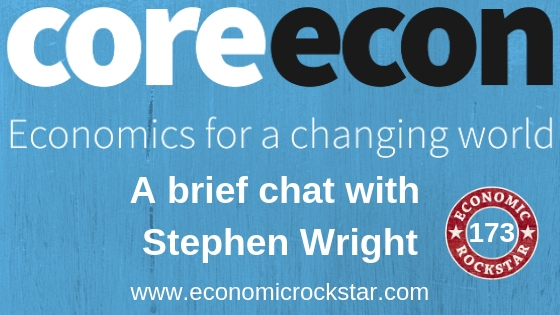 Stephen Wright is Professor of Economics at Birkbeck College, University of London. Previously Professor Wright worked at the Bank of England and Cambridge University. He is co-author of ‘Valuing Wall Street: Protecting Wealth in Turbulent Times’ – an informative book published in 2000 warning of the high values placed on stocks at that time. In this episode we discuss his work on valuing the stock market using a variant of Tobin’s q – a valuation method put forward by the late James Tobin (Nobel Prize in Economics, 1981). Wright, S. (2004). Measures of Stock Market Value and Returns for the US Nonfinancial Corporate Sector, 1900-2002 Review of Income and Wealth, 50 (4) pp 561-584.